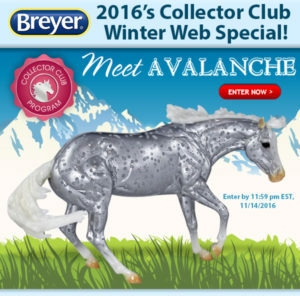 A few pictures of a grey Breyer Misty appeared in the Back In the Saddle catalog and some other places. 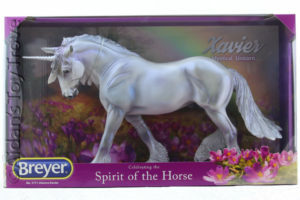 Now, that Misty is officially available for purchase directly from Breyer’s website! 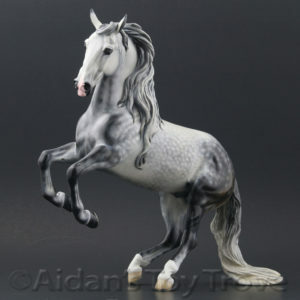 She is being released with the Stormy foal in a set called Breyer Wish and Wonder 712279. 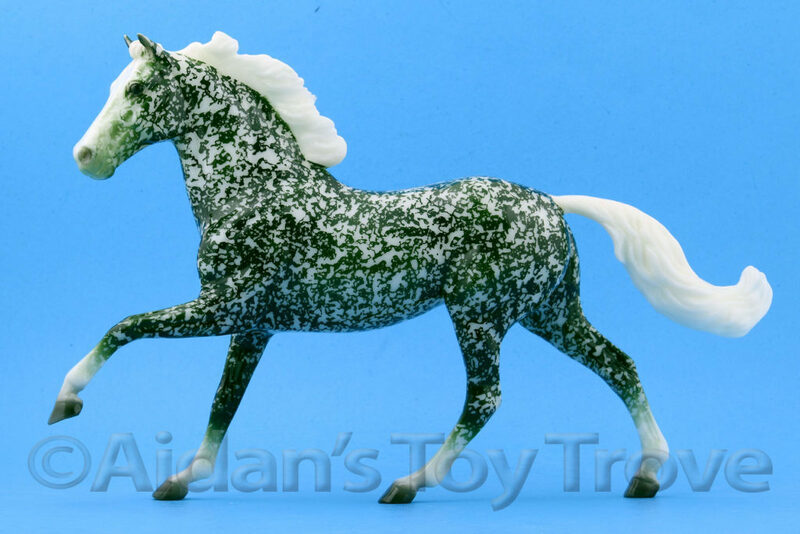 A number of collector’s have expressed distaste for the look of the unpainted plastic that Breyer typically uses for white markings. This was an especially big problem with Dundee who’s mapping sometimes looked downright strange alongside the bare plastic. I noted that Emerson, the latest Breyer 2018 Premier Club model that the white markings were painted. 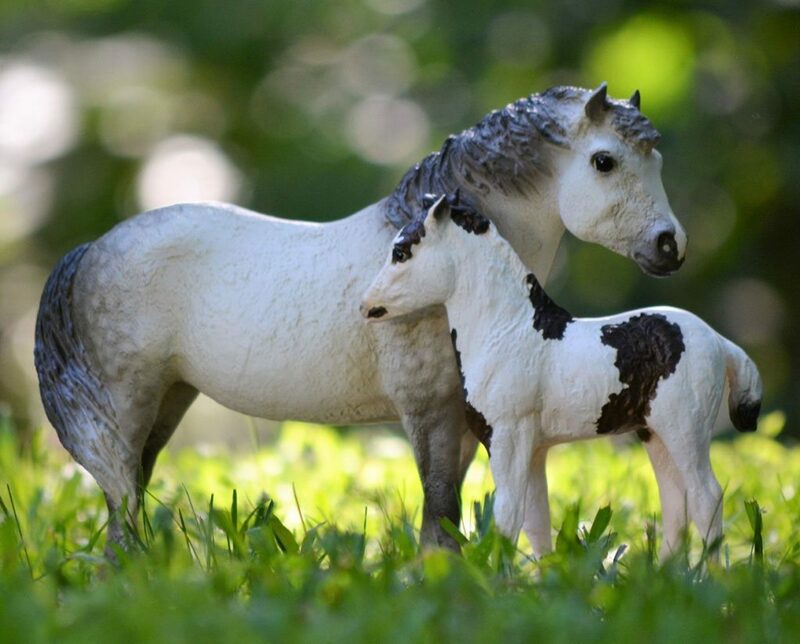 The Breyer Wish and Wonder appear to be chalky, meaning that their white is painted on and is not bare plastic. 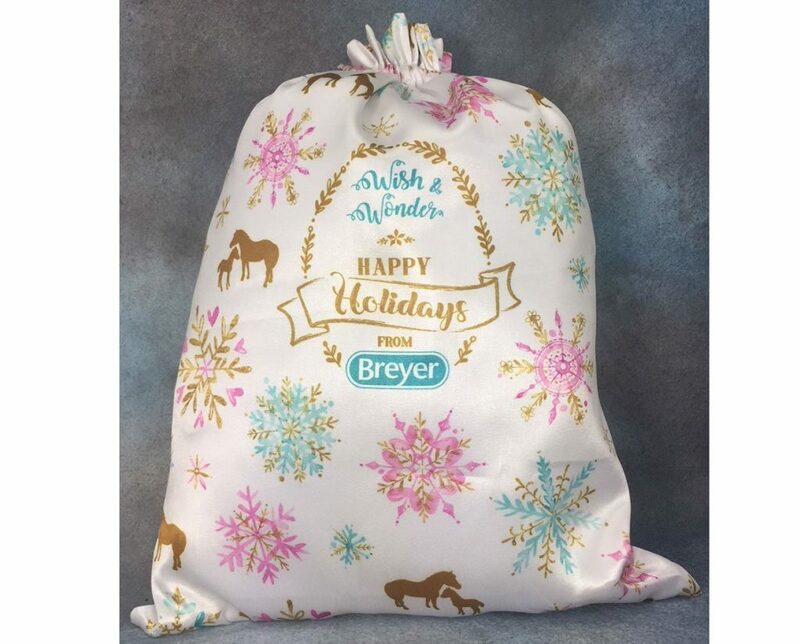 Bravo Breyer! 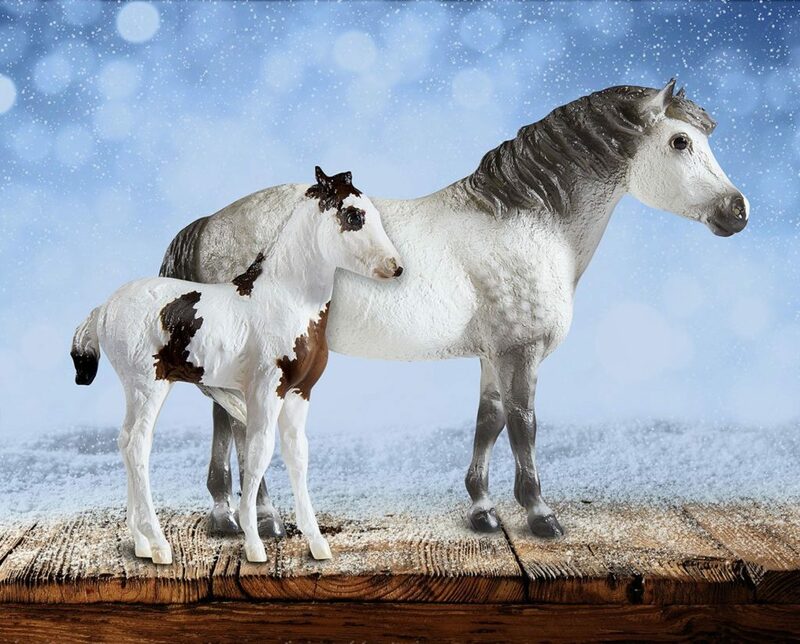 I personally do not collect the Breyer Christmas Mare and Foal sets but I might make an exception for Wish and Wonder. They look really nice! Misty is a lightly dappled grey and Stormy is and adorable sooty buckskin or bay pinto. The chalky white basecoat compliments their fuzzy hair and make me want to hug them! This set comes in a festive satin gift bag, making it a beautiful gift to give and receive! One per order. 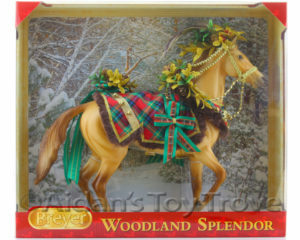 The Breyer Wish and Wonder set is priced at $50. Domestic shipping is FREE <gasp>. Historically, Breyer has offered Free Shipping on the Gambler’s Choice Christmas Decorator but not on the Christmas Mare and Foal Sets. 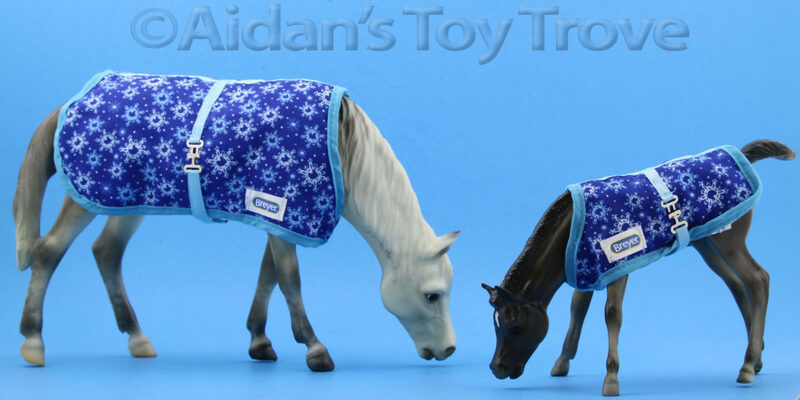 The Christmas Mare and Foal sets also came with cute winter blankets (including realistic working buckles!) but Wish and Wonder do not have blankets but they do come with a festive cloth bag. 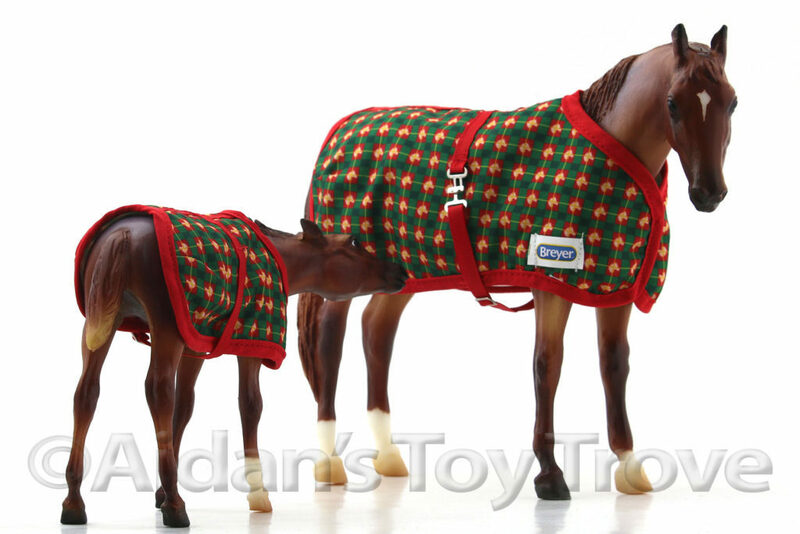 2014 was the first year that Breyer offered the Christmas Mare and Foal set. The first offering was the Vixen and Blitzen set. 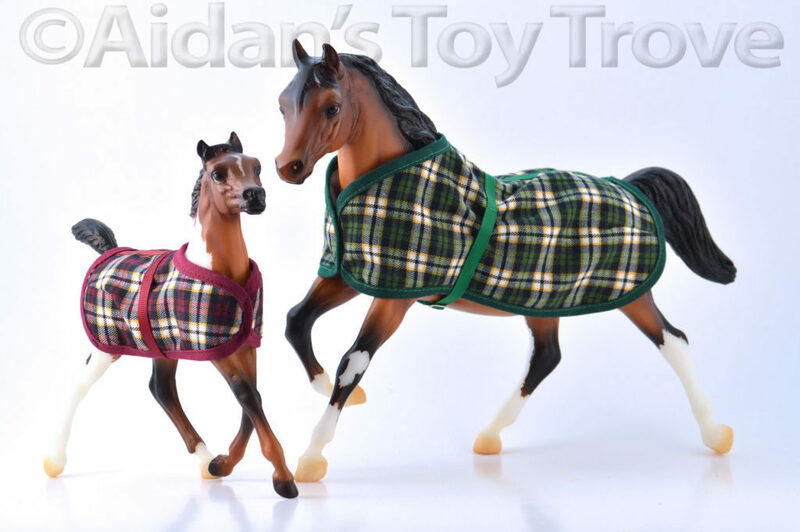 Sadly, this set seemed to have a lot of staining from the horses being shipped with the blankets on despite that protective plastic layer (Athos and Kris Kringle anyone?!). They were the Breyer Running Mare and Running Foal molds in matching bay pinto. Hi guys! I’m feeling a bit more relaxed now that I finally finished packing all of the orders shipping out today. Hubby and Aidan are in Las Vegas so it’s just little old me running the store. Should I be afraid that the boys are alone in Las Vegas?? They went shooting in Indian Springs and hubby is threatening to buy another gun, LOL. Today I listed a lovely Leah’s Fancy Chick to eBay as a Fixed Price Listing with Best Offer enabled. She was the 2000 BreyerFest Celebration Horse and is still one of my favorite Celebrations Horses to date. But I do have a soft spot of Lady Phase! Direct link to Leah’s Fancy Chick’s listing on eBay. We do plan on offering some Thanksgiving Day and Black Friday Specials. The thought of everything that needs to be done still is a bit daunting. 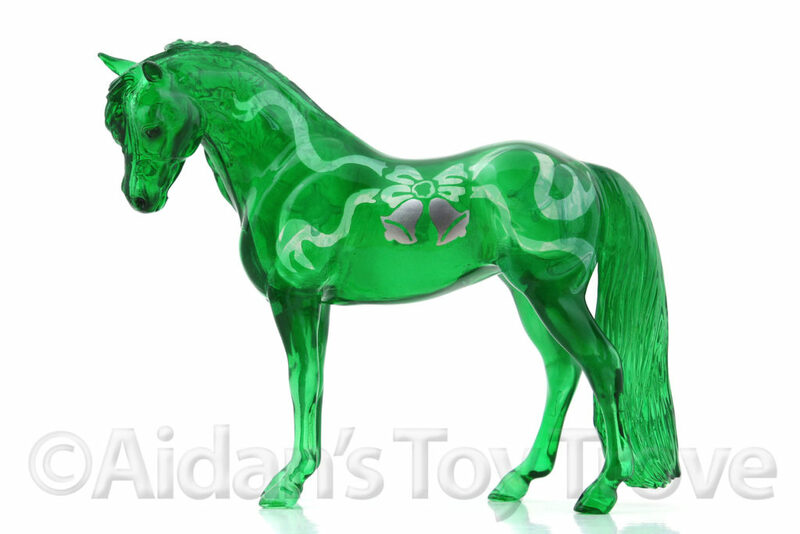 But be on a look out for specials both on eBay and on Aidan’s Toy Trove Website Store! I have a question for you all. The website has been painfully slow from my end. But the internet here in general has also been slow and I fear that my laptop is on its last leg. Are you experiencing excessive load times for our website? I think it may have something to do with the cache plugin that I had to turn off as it crashed the webite, yikes! Thank you in advance for any feedback! My last video was of the sales shelf on top of my cabinet of personal Breyer horses. I collect custom finish Breyers. Here is 1 shelf of them. None of these are for sale. This is just a sneak peak of my personal collection. I’ll make more videos if there is enough interest. FedEx SmartPost – Color Me Frustrated! Keep in mind, FedEx SmartPost is only offered in Aidan’s Toy Trove eBay Store as we can’t create FedEx SmartPost labels outside of eBay for website or private sales. Over the weekend, we had a few of these particular items sell on eBay and I spent a good portion of the morning creating custom boxes for them (as we don’t stock these size boxes for non Priority Mail). FedEx SmartPost packages have to be dropped off at a FedEx location even though they are delivered by the Post Office. I loaded up the car and drove over to the only FedEx drop (which is a small little local mailing place) and guess what?! The mailing store is moving locations and is closed during their move. ARGH! The closest FedEx drop other than this particular store is 90 miles away. I might be able to pay for a FedEx Pickup but I’m not sure as the website says that the pickup option is for FedEx Ground and Express packages and it’s rather costly and is charged by the package. Oh the joys of living in the middle of nowhere! Soooo…today, I will be stalking our small town’s ONE FedEx Ground driver. I’m crossing my fingers that I can catch him. I almost never offer FedEx as an option and the one time that I do, this happens. What are the odds?? On the bright side, it’s a nice sunny day! I might just go walk around the neighborhood and catch some Pokemon and hope that I hear the rumble of the FedEx truck!